The in basket: When I saw a Bremerton police black and white patrol car pull out of a side road on Mile Hill in South Kitsap Monday about 10:15 a.m., I thought it mildly curious. When I saw it again or one just like it making a traffic stop on Highway 166 near the Banana Hammock expresso stand in Port Orchard about an hour later, my curiosity was piqued. 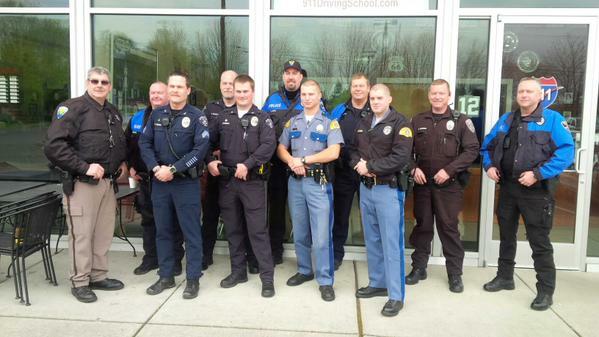 It lasted only until I got back on my computer and found a tweet from State Trooper Russ Winger saying, “‘Hopefully, you won’t meet one of these officers in South Kitsap today,” accompanied by a photo of 11 uniformed officers. He was touting the distracted driving emphasis patrol being done between 10 a.m. and 2 p.m. Monday, just in SK. Marsha Master of the county’s Traffic Safety Commission said the 11 were working the south end with an eye out specifically for drivers not paying attention to what they were doing. I imagine cell phone use and texting generated most of the stops made, but personal grooming and eating were candidates. Marsha had gotten only one anecdote about a stop by Thursday, and it was off-topic. An officer heard chains dragging on the pavement in Gorst which called his attention to a driver towing a trailer without his safety chains secured to prevent his trailer from getting away . Reports from the officers received by Thursday detailed 80 or so stops during the four hours, and she expected it would total more than 100 when she gets them all. She hadn’t counted how many citations were issued, she said. 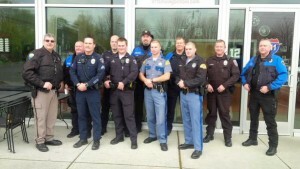 Those officers will be doing another one on Bainbridge Island on April 18, a countywide seat belt emphasis on May 18, and a speed emphasis around June 1. She drove around watching some of the stops Monday, and the drivers pulled over seemed more chagrined than angry, she said. There were reports Monday of a lockdown at South Kitsap High School (unfounded) and just a lot of police activity near the high school. I couldn’t find out what it was about, but maybe it was young texters and cell phone users getting the attention they need. The in basket: Christine Larsen of Lake Helena Road writes, “My concern is about Glenwood Road (in South Kitsap). With the death on that road (in November), I have counted at least 7-8 deaths in separate accidents of mostly young people since I moved here in 1997. That just seems like a high rate for a country road. Every time it happens, I wonder if someone is going to look into why it’s so frequent. “I’d be very interested,” Christine said, “to breakdown the causes of the fatalities on Glenwood in the last 20 years or so and attempt to determine what the dangerous factors are. Obviously speed is one of them. I am guessing the curvy road and large trees are another, but is there anything else that these accidents have in common? The out basket: Jeff Shea, traffic engineer for Kitsap County, which owns the road, says, “We have collision records back to 1992. Between then and now our records show nine fatal collisions with 10 fatalities along the eight miles of Glenwood Road. This does not include the most recent collision. “’Had been drinking’ was noted on the collision report for six of the nine reported collisions. Excessive speed was also listed on some of them. Five of the collisions were run-off-the-roads at curves and straightaways, and only one of those didn’t involve alcohol. Two collisions involved a motorist pulling out in front of another vehicle, and in both of those cases alcohol was involved. “Except for the Lake Flora intersection, there is no other location where more than one fatal collision occurred. In 2004 and then again in 2009 motorists failed to stop for the Lake Flora stop sign and fatally crashed into the concrete block wall. Neither driver had been drinking. There were no skid marks noted on the collision reports, so there is no indication the drivers made an attempt to stop before hitting the wall. “The intersection has a large conspicuous stop sign and advanced warning stop ahead sign, along with street lighting at the intersection. Since the drivers died at the scene, it was impossible to determine why they missed the stop sign. “The block wall is there to support a large cut slope on which a house sits not too far from the wall. Cutting the slope back significantly would require moving the house. Glenwood Road is listed on the county Transportation Improvement Program for $2.6 million in improvements to include widening it, paving its shoulders and intersection improvements, between Wildwood and JH roads, to be done in 2016. Previous work, in 2004, was done between JH Road and Lider Road, included widening of the travel lanes to 12 feet, eight-foot shoulders, six feet of which are paved, some flattening of rises in the travel lanes, and a two-way turn lane between Lake Flora and Lider. It included storm water management and fish passage enhancement work, too. The in basket: Chris Olmstead of South Kitsap asks, “Is there any law that says a road needs painted lines? Harris Road has zero pained lines since it was paved nearly two years ago. Harris Road is a straight shot between Lund Avenue and Salmonberry Road. The out basket: Chris is mostly right, although there is about 20 yards of well-worn centerline stripe on Harris near Salmonberry Road. Jeff Shea, Kitsap County’s traffic engineer, says, “The only mandates we have for striping are on paved urban arterials and collectors with traffic volumes of 6,000 cars per day. The (federal) Manual on Uniform Traffic Control Devices states that urban arterials and collectors with 4,000 vehicles per day and rural arterials and collectors with 3,000 vehicles or more per day should be striped. The ‘should’ statement doesn’t make it mandatory to stripe these roads, but we do stripe them. We can also stripe roads for other reasons such as road alignment, collision history or parking conflicts. For the most part, we don’t stripe 30 mph or less posted speed limit, local access roads. “Harris Road is classified a local access road with a posted speed limit of 25 mph,” Jeff said. “Traffic volumes on the road are only about 1,000 vehicles per day. The in basket: As a South Kitsap school bus turned right while I sat at the Woods Road stop signal on Mile Hill Drive, I noticed a large white X on a black background on its side. I’d never noticed it before and it seemed vaguely ominous. I subsequently saw other letters of the same kind on other SK buses, and one in Bremerton. The out basket: Here’s another measure of how far removed from my school days I am at age 68. Jay Rosepepe, transportation director for SK schools, said letters have been on the sides of their buses for about four years, supplementing the numbers that differentiated the buses when I was in school. They are magnetic and can be moved from bus to bus. It eliminates confusion among the students when a bus has to be pulled out of regular service for maintenance or to carry students out of district, such as for athletics. Something like it began 15 years ago in the district, when cardboard placards that serve the same purpose were displayed in the bus window or windshield. They got the idea for the magnetized metal ones from Bremerton School District, he said. They’re used only on the district’s 48 large buses. They already need two letters on about half the buses to avoid duplication, and adding the smaller buses would require three-letter sets. Besides, the close relationship between the drivers and the often-disabled youngsters who ride the small buses reduces possible confusion by itself. They still use bus numbers, but that’s usually for administrative purposes or in radio communications with the vehicles, he said. The in basket: Richard Brooks wonders when Salmonberry Road in South Kitsap will be repaved. It has needed resurfacing since 1965, he said, and gets patched about six times a year. The out basket: Salmonberry is a peculiar looking road, in that the eastbound lane is in pretty good shape but the westbound lane is a mess. Most of those patch jobs Richard mentions must have been in that lane. Doug Bear of Kitsap County Public works says it has a chip seal surface, which involves pouring gravel over hot oil and letting traffic compact it into a paved surface. That was last done in 1972. The county’s biannual rating of Salmonberry had it at 55 on a scale of 100 in 2010. It will be rated again this year. If it has dropped below 49, it will get a new chip seal, Doug said. The county plans to do a $100,000 study in 2013 of widening the lanes of Salmonberry and building sidewalks from Bethel Road to Jackson, but the actual work doesn’t appear on the county’s road plan, which goes out to 2017. About $700,000 in improvements to Jackson Avenue’s intersection with Salmonberry is on the road plan for 2017.